I will never understand the DC/Marvel fan divide. It’s just one of those things that doesn’t make any sense to me. Why people feel the need to take two things that are virtually the same thing, declare undying loyalty to one, and perpetually lambast the other makes no sense to me. I mean, I guess sports are the same thing. And if you own a video game system, you may have a stake in making your friends buy the same one so you can all play together, but Marvel and DC? They both make comic books! You can buy and read both at the same time! I’ll be honest. I love both companies. But anyone who thinks DC makes movies that are even remotely comparable to the MCU are weird to me. From Man of Steel onward, DC has not had anything I would consider a memorably good movie. Conversely, I think DC has consistently outproduced Marvel at actual comic books since, say, the late 1980’s. With the exception of some hiccups like The New 52. But I enjoy the output from each in all regards. Just enjoy them both, people! Lots of good stuff all around. The impetus for this rant being the drama that won’t die around the frankly excellent Captain Marvel flick. 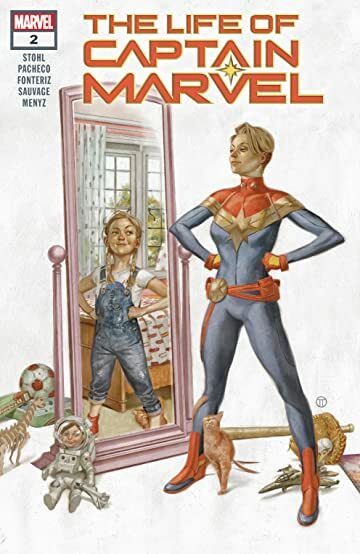 We reviewed that very movie on our podcast recently, and we spent the second segment discussing a recent Carol-centric book, The Life of Captain Marvel. No sooner did we publish the episode than I realized there was something I wanted to talk about regarding that book that I did not on our first go-‘round. So here is my re-evaluation! The Life of Captain Marvel is a mini-series that radically altered the backstory and origin of Carol Danvers and how she got her powers. It starts with Carol having a panic attack mid-fight when she is reminded of her dead, abusive father. As a way of coping, she returns to the small town in which she grew up so she could visit her family. Her stay is extended by a few months when her brother gets into a drunk driving incident and becomes comatose. While Carol helps her mother care for her sibling, she reconnects with a childhood friend… and discovers love letters that her father wrote to a mystery woman. The big reveal is that Carol’s mother is actually the mystery woman. Her real name is Mari-Ell, and she was a Kree soldier who came to Earth. Undercover as a human, she met the man who would become her husband, abandoned her mission, and settled down. The letters written by Joe Danvers were to the woman he fell in love with, but who, he felt, was not the woman he was then married to. It’s a comic book, though, so there’s a big fight! Mari-Ell’s old locator is set off, sending a Kree Kleaner after her. In the scuffle, Mari-Ell dies, and boy… what a waste of her character that is. My initial thoughts on the book were simple: the beginning is drawn out, there’s too much mystery where none really needs to be, and the story should focus more on Mari-Ell and Carol together AFTER the reveal. Instead Mari-Ell is killed, and an opportunity felt missed. When I thought more about it, though, there’s a painful tragedy at the heart of this story, and it’s one that, despite some interstellar attachments, is all too relatable and realistic. Mari-Ell arrives on Earth as a proud warrior on a mission, but upon meeting Joe and spending time with him as a cover, she discovers true feelings for him. Despite her history—despite her very upbringing and birthright—she exiles herself from her previous life to be with the man she loves. And for a while, everything is perfect between them. It’s the birth of Carol that changes everything, even if slowly and over time. Mari-Ell and Joe have disagreements about to raise their daughter, but more than that, Mari-Ell simply stops being the powerful, energetic woman Joe grew to love. Feeling abandoned by his beloved—and under the constant threat that his daughter could be hunted by her own kind—he succumbs to his demons and becomes dependent on a bottle to get through each day. Ironically, all things considered, it’s a really human story. People change, and when the stress of life gets to be too much, it can crumple bonds that once seemed unbreakable. Two people who have spent the most important years of their lives on the same page can have a child and suddenly dream of very different things for her; you either grow stronger by working together or you grow resentful when you can’t. And that’s what happened here. Joe and Mari-Ell had a storybook romance… until they didn’t. And when it turned, Joe resented her and became emotionally abusive, while she gave up on her dreams and felt stuck in the life she made for herself. She even sells her wedding ring to help support Carol when Joe refuses to help his daughter her her post-school plans. It’s really depressing, but an experience that so many of us have likely seen in someone we know. It’a not a beautiful, flawless love story for Joe and Mari-Ell, but neither is it a relationship that goes up in flames and can be moved on from. It’s just… a sad story of two people who became unhappily stuck together. Anyway, this whole backstory is revealed in issue four of the series, and it’s an absolute stand-out chapter. The problem is that the rest of the series is not even close to its level. The first three issues are a bit of a drag and too melodramatic, and the fifth sees Mari-Ell killed before getting much development with Carol. It’s not all bad; the art is beautiful all around with some stand-out fantastic covers and gorgeous interiors. It just feels like… if only the rest of this series was as good as the fourth installment! Talking Point: So this was a pretty radical alteration of Carol’s history, making her genetically Kree so that Mar-Vell only unlocked her powers; he didn’t cause them. What, if any, retconned origins of other characters do you think either hit or missed the mark? Spider-totem, anyone? Issue four is a definitive A+ for its emotional, tragic story of Joe and Mari-Ell. The rest of the book slides along the scale from fine to barely adequate. Carol’s constant panic attacks feel less humanizing and more forced to make the story work, and it spends too much time on the wrong material. But still… one stellar issue and some terrific art… that’s enough for high marks.